Too Many Thoughts: Where have all the good books gone? --- and wandered over to the R's, where my favourites Philip Roth and Salman Rushdie reside. Roth was more than adequately represented, with new editions (look for the book covers in primary colours) of just about every one of his major works, and a number of minor ones too. Rushdie, however, was languishing as McEwan had been: only Grimus, The Moor's Last Sigh and Shalimar the Clown (two copies) were wedged onto the shelf, lost amidst the spines of other less weighty but visually more striking books. "I want to do a test. Give me the name of another famous author," I said to my friend. "Margaret Atwood," she said, because we had just been talking about the cover of Moral Disorders. There were also only three Atwoods on the shelf: Moral Disorders (a bunch of copies), The Penelopiad and The Tent (one each); we later stumbled upon Negotiating with the Dead in the literary criticism shelves. "Is Borders not selling real books anymore?" I wanted to know. Fortunately, my next litmus test was Milan Kundera, which passed with flying colours. And then we decided to get outta there before we bought up the entire bookstore with those lovely 30% discount vouchers (print as many as you like; they expire today), so I didn't get to do any more tests. But still: only three Ian McEwans (and my friend bought one of them, Amsterdam), three Rushdies and three Atwoods (fiction, anyway) --- whereas in the past they've carried practically each writer's entire oeuvre? "Maybe they haven't restocked the books 'cause people have been buying them in the sale," saith my friend. To which I retorted, "There aren't that many people in Singapore who would read Rushdie." The other thing I do at bookstores is rearrange books if they're misshelved. 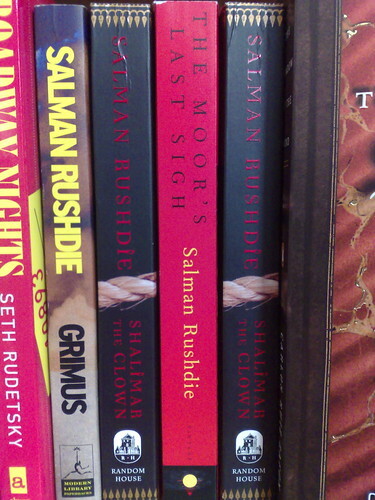 So if you went looking for the above-pictured shelf of Rushdie today and if no one tampered with my arrangement after last night, you would find the two copies of Shalimar the Clown side by side (as they should be), with The Moor's Last Sigh shelved to their left. i was there last week and noticed the same thing. only 1 rushdie at the time: grimus. i was all ready to buy more, too. u can buy from amazon, use http://yasubooks.com.sg. very affordable.